I gulped when I looked at the price on the small plastic deli container of pico de gallo. I often do this at Whole Foods; it’s part of my love-hate relationship with them. On a normal day I would have put it back, gathered up the ingredients — from, ahem, the local greengrocer — and headed back to the kitchen. But I was already behind in my grocery shopping. The prepared pico de gallo would have to do. It was fresh and tasty, no question. We nearly inhaled it with half a bag of chips, as I remember. But the next chance I got, which didn’t take long since chips-salsa-guacamole is a regular cocktail snack around here, I made sure to have the ingredients on hand to make it myself. And save some money. 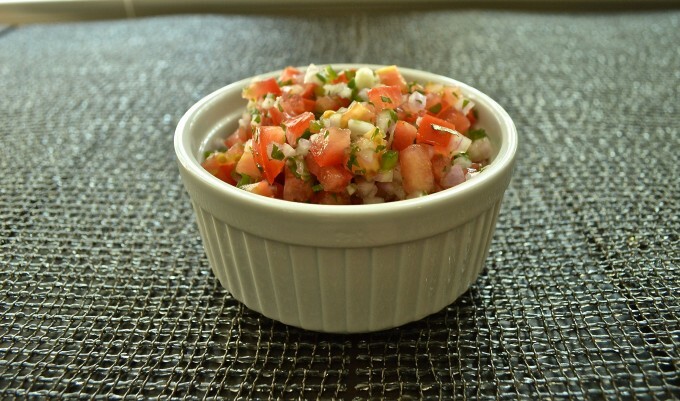 Pico de gallo is a great pre-dinner nibble, but it’s good for more than just a dip for tortilla chips. I think it deserves a spot right on the dinner plate, especially this time of year when the local tomatoes are bursting with flavor, and the sunny patio draws me away from the kitchen more often. And really, unless you’re making pico de gallo for big gathering, the chopping doesn’t take that long, maybe 10 minutes or so. 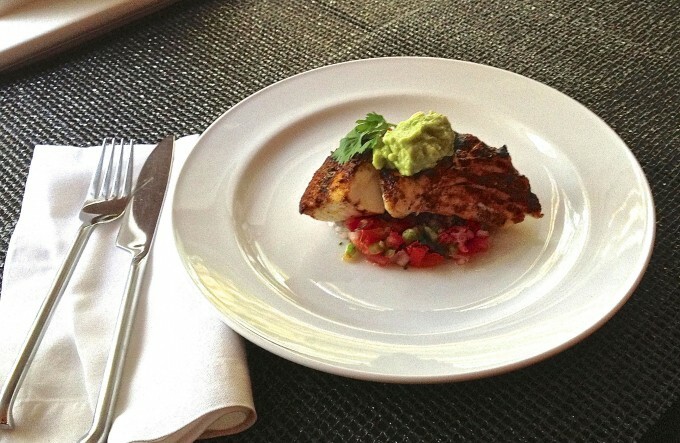 It pairs wonderfully well with grilled chicken, shrimp or (like in the photo below) grilled halibut jazzed up by ground chili and cumin. Next time I have house guests in the summer, I know exactly what to serve. I use roma tomatoes because they're meatier and yield more flesh once they're seeded. The lime juice is enough to keep everything moist, and as it sits the salt will draw out some moisture from the tomatoes too. This is best made the day you're going to be eating it, but it will keep covered in the fridge for a day or two. 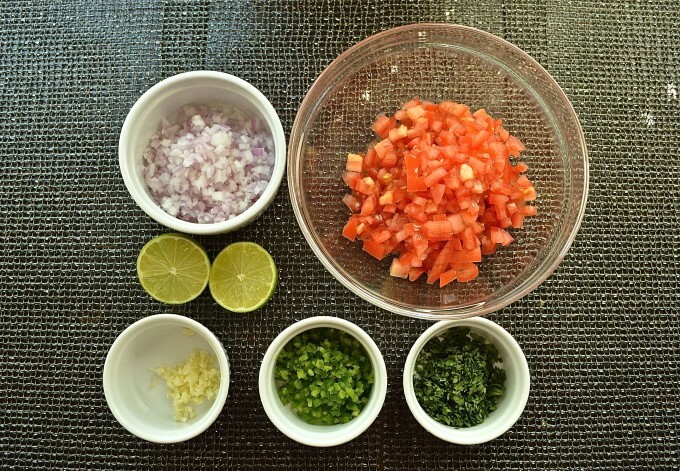 Finely chop the tomato, garlic, red pepper, jalapeno and cilantro leaves. In a medium bowl, add all the chopped ingredients and mix together until evenly combined. Squeeze the lime over the bowl, and add salt to taste. Easy, hey? 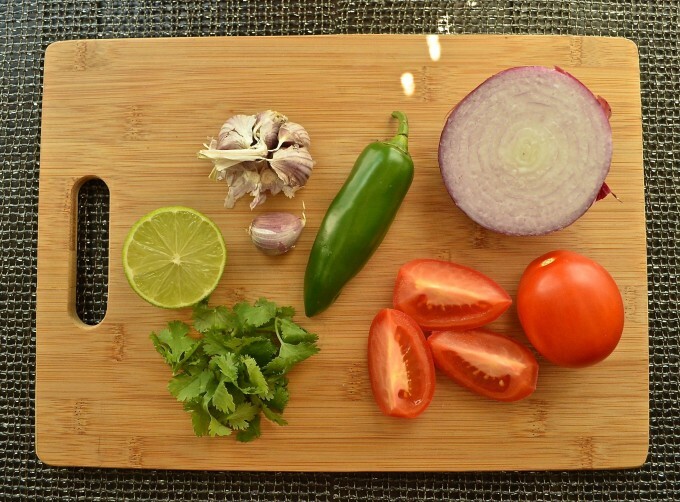 If you like a milder pico de gallo, add only part of the chopped jalapeño and taste it once you've added the lime juice and salt. Also, when chopping the jalapeño pepper, I always use rubber gloves to protect my hands from the heat. Good enough to eat by itself. Mmmm, yes — I agree, Linda!